Travel Pics Theme: On the Road Again! Flying the Flag. As an Australian – for whom patriotism is a quiet, abiding, but largely personal thing – the ‘in-your-face flag waving of Americans is a bit surprising at times. On our first visit to the US, we went to Hawaii – and one of the first things I noticed (and photographed) was the number of flags being flown on private homes – on balconies of apartments and front yards of houses, as well as on all manner of public and private buildings. And of every subsequent visit, it has struck us how public these displays of patriotism are in the US. That’s particularly so in this election season in the US – on Saturday, for example, we drove past a Republican Party voter registration site – where they had a hot-dog grill, and bunting, and red solo cups (another American staple) … and perhaps 10 flags all in a space which could hold fewer than 50 people. 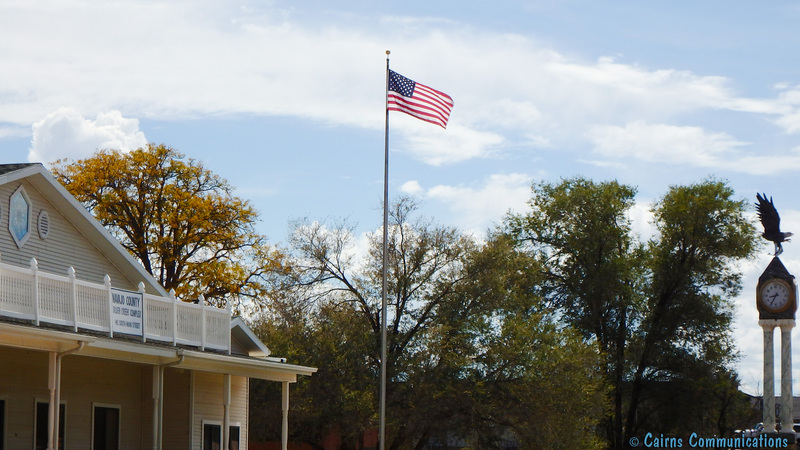 We were in the town of Snowflake, Arizona – which was holding its Harvest Festival – and as we were leaving the town we spotted the Navajo County Sheriff’s Office in Snowflake .. and I was again struck with how the juxtaposition of “Freedom Eagle” and “Stars and Stripes” was just so .. ‘Murrica! Travel Pics Theme: P for Pacific. A potted history. Travel Pics Theme: On the Road Again! The border, the wall, the reality.